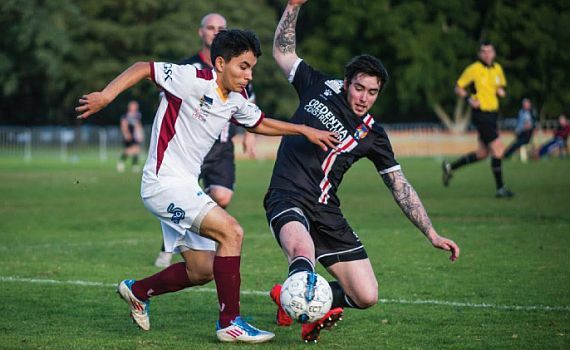 ECU Joondalup stretched their unbeaten away run to four games with a 2-1 win against Subiaco at Rosalie Park on Saturday. All the goals were scored in the first half as Harry Bissett and Tommy Amphlett set the visitors cruising, before Josh Booysen pulled one back before the break. ECU survived a late rally from the home team but held firm to grind out a victory, which coach Dale McCulloch hopes will give momentum to his youthful team looking forward. ECU Joondalup started the game sharply and took a deserved lead inside 20 minutes. Bayley Montgomery kept Amphlett’s cross to the back post alive and the ball was eventually bundled in with the last touch coming off youngster Bissett. Buoyed by the opener, ECU doubled their lead four minutes later. A corner was not properly cleared by the Balcatta defence and Amphlett struck crisply into the far corner for 2-0. Subiaco responded quickly, though, and pulled one back when Booysen drove down the left, cut inside and scored to cap a fine solo effort. A scrappy second half followed, but as the game wore on, the hosts mounted late pressure on the ECU goal. First, substitute Kevin White found a yard of space on the edge of the area, before clipping the base of the post. Matt Akehurst then fired dangerous beyond Jamie Serra’s back post, but ECU stayed resolute on this occasion to take the three points back up north. Subiaco: GK Ryan MONTGOMERY, 2 Nathan DIAZ, 3 Ger FITZGERALD, 4 Jackson DONGRAY, 5 Alexander TRIGLAVCANIN (14 Siyang ZHANG 26’), 7 Matthew AKEHURST, 9 Ian MCMURRAY (8 Kevin WHITE 63’), 10 Zac HARDISTY, 11 Joshua BOOYSEN, 13 George TCHAMI (6 Ignacio DOMINGUEZ 79’), 15 Owen COATES – Subs not used: 12 Dylan ANDREWS, 21 Anastasis FARSALAS.